“Flame kick werewolves, perform thrilling acrobatic stunts, and run a trillion dollar mining company in Riverman Media’s combat-action masterpiece!”. That, for multiple reasons if you enjoy a good quick fight here and there, with a look and feel all to its own. A uniqueness in style, look, and story elements. Yet, simple in all three. It’s also something you can play on the go. There is a challenge that can go well beyond what one would pay for a game less than $5.00. By that, I mean entertaining for the long run. 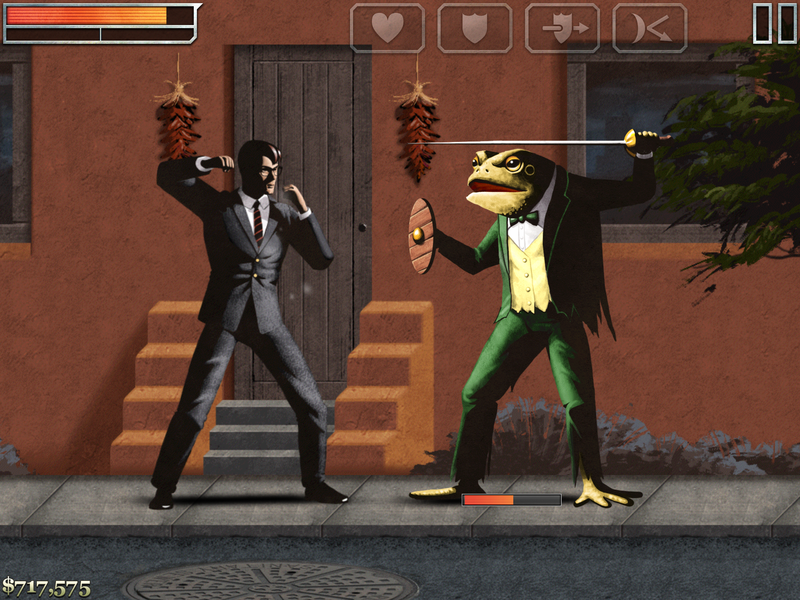 The gameplay is simple..punch and kick with the occasional super power-ups and timing. 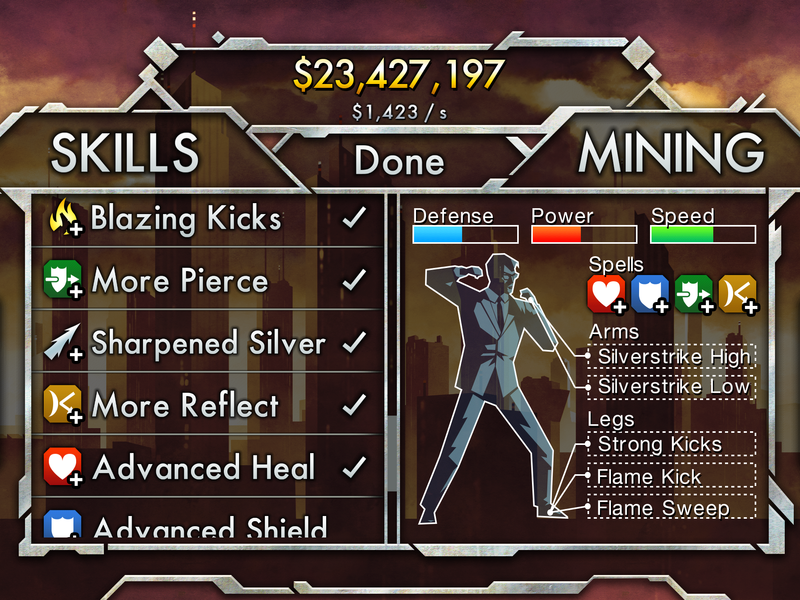 In between fights, run and do some crazy “stunts.” Rewards involve a fake monetary cash system, of which you can upgrade your skills and hire “employees” to mine for more fake cash. The enemies become tougher, quicker, and trickier as you progress. The Executive must adapt and become better though 120+ levels to win. Yes, plenty for the price. The control scheme is simple, as there is only one-finger swiping involved. In fighting challenges, you tap where to hit..high or low, or use different kind of swipes for different moves and abilities. The rest of the pushing involves icons, menus, and timed arrows for the “stunts.” Easy to do on a small phone, and fantastic for the iPad (I played on my iPad mini). The story itself is a bit strange. From what I gather, you are the Executive..in which you help run a silver mining company. Suddenly, enemies appear as werewolves and other werecreatures (probably looking to sabotage this silver business). The fight is on for the Executive to battle these werebeasts with his awesome abilities and skill. Part of the story is the sweet art and visual design. The art is all within a sharply animated side-scroller rail. The character designs are of various beasts with fluid movements and attacks. The looks on each is impressive up close, the result of hand drawn creations..not 3-D modeling or pixel art. The background is cartoonish, yet fitting; perfect for this absurd premise. The music is also great, with multiple tracks fitting for different backdrops and situations. It’s well composed and not overly repetitive (unlike many other games of this price). Evidence of this and the art shows hard work happened to make the game entertaining and fulfilling. Overall, the game is for the causal player wanting a better challenge than fruit slicing and bird flinging. There is a call to classic nostalgia with the side-scrolling fighting styles and tapping, but not as complex as your Street Fighters out there. And, the originality does eventually fall flat as progression in gameplay reveals new enemies, which are often re-skins and updates of the older enemies. The challenge also falls a bit with successful mining, where with the right choices leads to easy payments for upgrades before needed. Eventually, the upgrading can tire out and you feel kept up with whatever challengers are close ahead. I feel in time, I will master this game. Still, The Executice is fun and worthwhile for its price. But, there is an end I foresee; probably with the last level difficulty, and the beating of the last monster listed in the “Bestiary.” But that’s okay, as I do not expect the world in a game for $4.99 or less. But the Riverman Media developers have done well with this adventure, and I will keep a close eye on any future developments from the same.